The Port of Iberia is strategically located in the heart of Cajun country along the Louisiana Gulf Coast between Houston and New Orleans. The 2,000 acre industrial and manufacturing site is home to over 100 companies involved in oil and gas fabrication and production, materials handling, marine services and more. The Port of Iberia has direct access to Gulf Intracoastal Waterway and access to the Gulf of Mexico through its 13 foot deep main navigational channel. In addition, the port is connected to rail and four-lane roads (future I-49 South corridor). A fully instrumented 8,000 foot runway general aviation airport is within three miles. We’re ready to join in your business success at The Port of Iberia. Why locate at the port of iberia? 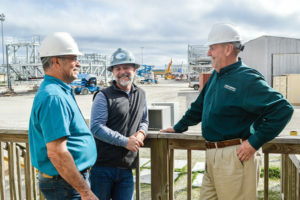 Craig Romero discusses project with Jeff Clement of Dynamic Industries and Iberia Parish Council Member Eugene Olivier. The Port of Iberia is off to a great start of 2019 according to Port of Iberia Executive Director, Craig Romero. 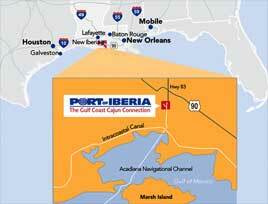 “Quite a number of port businesses have new contracts and projects,” stated Romero. “The Bayou Companies are busy with 1.8 million feet of pipe coating for a major pipeline project. The pipe was previously coated by Bayou Companies. However, the project was put on hold for a few years. Now that the project is back on track the pipe needs to be cleaned and recoated.” The pipe is transported by barge and railway. This is only one of the contracts for Bayou Companies. Whether yours is an expansion project or a new business, your company can find an outstanding opportunity at the Port of Iberia.